I am Not Half Awake - Life's Never Boring Beibi! 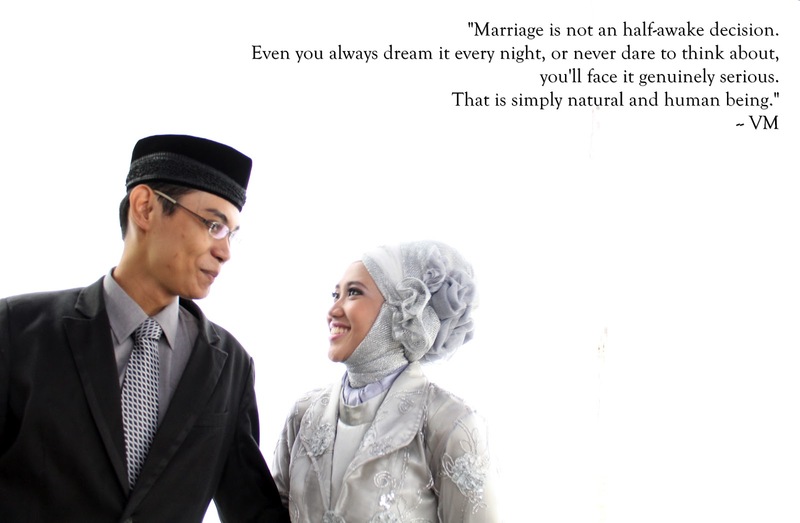 are you conscious enough for marrying him/her? If you are a newlywed, or having friend/relatives whose just married, I bet you will hear this often too. Many people used to have a joke by saying this. It's quite funny at the first, because then the dirty little secret about the spouse will leaked out. Old friends will say that he's so naughty in the past, very nosy, or she's a nonstop chatterbox, eating like a monster, etc. But when the conversation goes further, when the questions flare, you really don't know how does it start and something could suddenly burnt. Perhaps someone's heart, mind, or the worst, friendship and another kind relationship. Somehow, in my opinion, questioning about people's consideration at marriage is weird. I thought, every people just agreed about the weight of marriage commitment, even people who choose for not being married. It becomes silly. Of course, they didn't sleep when they choose to say "I do". I believe that a man and woman who mentally healthy, will do several deep thoughts before their marriage. Let's respect each other as a human being, a creature with mind and feeling, who could think and decide the best path for themselves. Maybe, this writing sounds angry. Not really. I just want to speak out my mind, nothing more. Kisses!